The wisdom mantra of the Bodhisattva Manjushri is pronounced "om a ra pa tsa na dhi" is an essential part of the Yidam practice to Manjushri, believed to enhance wisdom and increase the ability to learn. 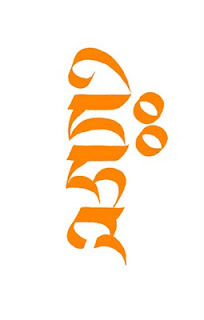 The mantra is depicted above in the ancient Sanskrit Lantsha script. 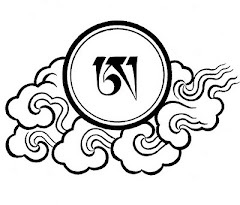 Another depiction of the Manjushri mantra in the Tibetan Tsugtung script. 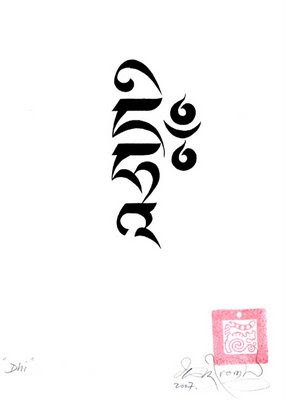 The root syllable of this mantra is 'dhi', as shown at the top of the page and here on the left, are depicted in the Tibetan Uchen script. The seed syllable of Manjushri can be chanted as a rapid and continuous flow, rolling off the tongue 108 times in one breath. As a young monk, one of my first Yidam meditation practices was given to me by an age and wizened Tibetan, called Lama Thubten of Palpung. This practices was to recite and meditate on the deity Manjushri. I was told that this would enhance wisdom and help me learn quicker as a novice monk in the many tasks of study. I remember that part of the Manjushri text explained that one of the signs of fruition, from diligently engaging in the meditation, was that one may dream of writing or even of drinking ink. This notion amused me to think of gulping down a pot of the jet black liquid. Sure enough i developed a keen interest in the Tibetan language, which i was required to learn as a monk, as the many chanting from the manuscripts are in Tibetan. This sometimes demand 'speed reading', where the congregation of monks all chant together at great vigor and pace. As i already had a training in the arts, it was a natural step to develop my Tibetan handwriting to a more refined standard. I was soon given the job of 'scribe' where i spent many years painstakingly copying ancient crumbling Tibetan manuscripts, for their preservation and daily use in the monastery. This in its self was a great discipline, which laid a steady foundation, allowing me to be more expressive and free with my current calligraphy art. In 2008 i was propositioned to create a book of my calligraphy art works, which i am finding a seemingly long process. One of the requirements of a book is to have a portrait of the author, so i collaborated with a wonderful portrait photographer Rebecca van Ommen. I expressed to her that i wanted to depict the dream of drinking ink, which i thought was very fitting for a book on Tibetan calligraphy. 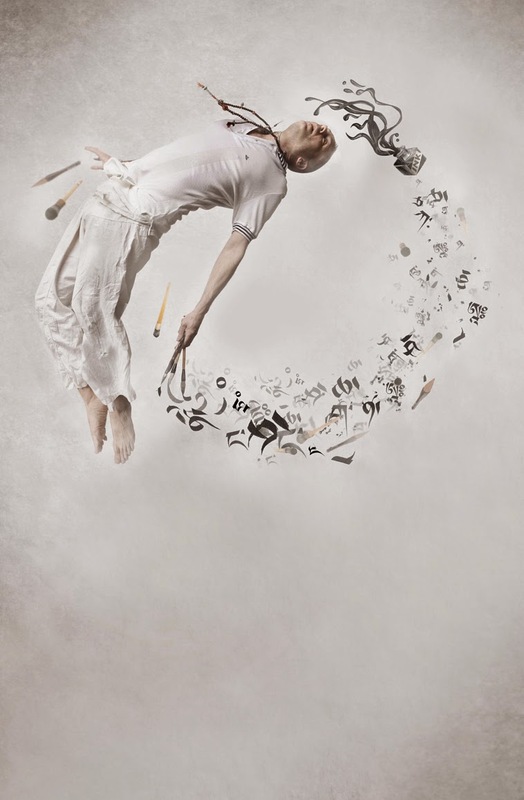 During the photo shoot; Rebecca had me jumping in the air to create the composition, she is also very skilled with photoshop, so to my direction she artfully placed letters of the Tibetan alphabet and my paint brushes, in a great swirl topped by a spilling pot of ink to my mouth.We finished the end of the photo shoot with a cut of tea. What would we have to drink?" As a child my sister used to sing to me this little rhyme. 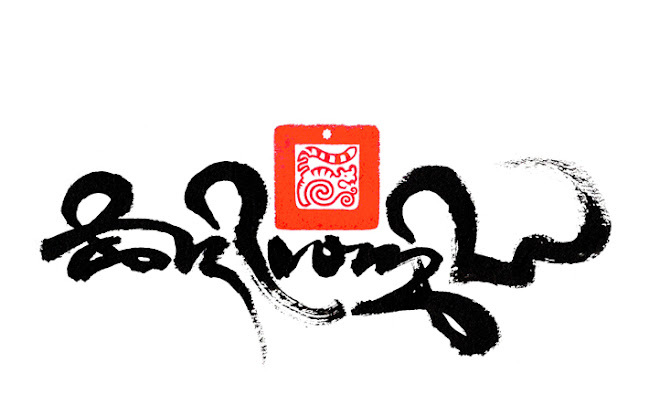 Calligraphy artist Tashi Mannox. all images shown and not stated otherwise are created by the artist and the photographer. please respect the copyright. Thank you.